Participation in team and individual sports not only promotes a feeling of family and belonging, but it allows students to develop themselves physically and emotionally. Students gain strength and skills and have the opportunity to develop leadership skills while learning the art of good sportsmanship and fair play. 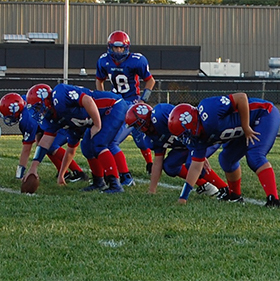 We’re proud to offer our MS Panthers a variety of sports programs. Come on out to experience the thrill of the competition and support our teams. The JCMS pool and walking track are open to the public throughout the year. We ask that you please adhere to all pool and track rules when using the facilities. If school has been cancelled due to weather or for any other reason, all JCMS facilities will also be closed for the day. The track is open to the public Monday–Friday, 6:00–7:30 a.m. and 4:00–9:00 p.m. There is no cost for the track use, but we ask that you sign in at the desk by the athletics doors. The pool schedule changes from week to week, based on the needs of the swim clubs. To contact the Athletics Department, call (812) 346.4940 (press 5 in the main menu).